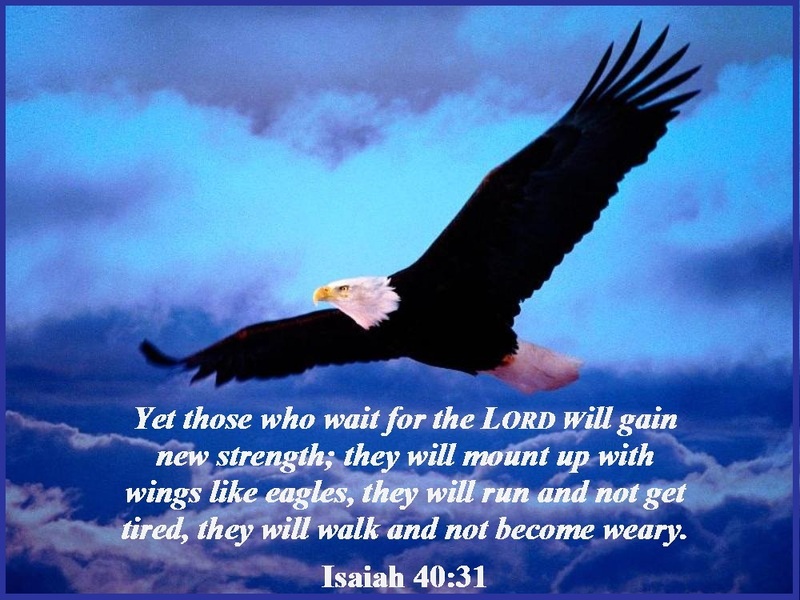 People are in such a rush that we need to really wait…….on JESUS. There’s fast food, there’s express check-out lanes, there’s express driving lanes if you 2 or more in your vehicle. We really need to slow down and let JESUS lead and guide us. WE WAIT FOR THE TOAST TO POP UP AND THE WATER TO BOIL. WE WAIT FOR BUSES TO COME, PLANES TO LAND AND CAR LINES TO MOVE. AND WE WAIT FOR THE WEEKEND, VACATION OR DAY OFF…. WE ALL SPEND A LOT OF OUR TIME IN LIFE WAITING AND WE REALLY DON’T LIKE WAITING FOR THINGS. — BECAUSE WE WANT EVERYTHING AND WE USUALLY WANT IT NOW…! When you wait on the LORD, HE will do everything HE says HE will do. He will renew our strength. HE will renew it physically and spiritually. I learned a lot these past three weeks with one of them in the hospital with a strong case of pneumonia and 2 weeks recuperating at home. I am free of pneumonia because JESUS healed me in HIS time and I had to wait on HIM. I knew this but it’s something I had to go through to learn it. I also learned about patience. I didn’t ask to learn it but it was something the LORD wanted me to get a hold of. Waiting on JESUS is very important because when we pray to HIM we need to understand that it truly is in HIS time and it will be in the way HE wants it to happen. We do have a free will but I tell you what, you will never go wrong follow the leading of JESUS. We know the stories in the Bible about folks who wouldn’t wait on the LORD. Like Abraham and Sarah, Mary and Martha, and the disciples. We need to be careful doing our own thing and doing it our way. When you let JESUS do it, it will always turn out the best in your life. Guaranteed. Make a promise to yourself that you will wait on the LORD to direct you and lead you in every decision you make. HE made my heart stronger physically and spiritually. This tells us that no matter what happens to anyone else. Even if the wicked looks like their getting ahead in life or prospering that wait on the LORD and HE will take care of business and take care of HIS own. HE will never let us down. Our Hope is in HIS Word. Read and study it. You will learn so much by doing this. You also will build a strong relationship with JESUS and you will never find a better friend.